Nasturtiums are an annual fleshy plant that has sprawling/climbing tendencies. Apart from when it climbs something it can grow to a height of around 20-25cm. The leaves are almost entire or palmately lobed in appearance(almost round), hairless and alternate the stem.They can range in size between 3cm to 8cm and are attached to the stem in the middle of the leaf. (The best way to imagine that is by thinking of an umbrella)They also have quite noticeable pale veins on the top part of the leaf that radiate from the stem. The flowers are striking in their appearance and are quite often yellow,orange and red in colour.They rise from long stalks from the axils of the leaves and look trumpet like. The flowers are around 2cm-6cm in size and have 5 petals. The seeds are around 1cm-1.5cm in length, nutlike in appearance and have 3 single seed segments. All parts are edible and are quite a spicy green.The leaves can be added to salads,cooked in stir fries or finley chopped and added to pasta dishes.The flowers can also be added to salads, stuffed or dipped in a tempura batter and fried. The seeds can be collected and pickled and is often referred to as the poor mans caper. 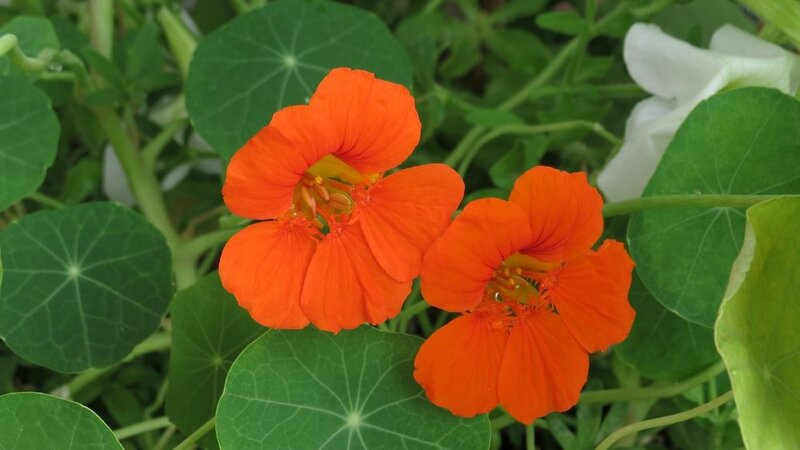 Nasturtiums have been used for centuries to cure all sorts or ailments. It is said to have antibacterial anti fungal and antibiotic qualities and can be used internally and externally. It is also said to help in the formation of red blood cells. The dried buds have a laxative effect and because of the high Vitamin C content can be used as a natural remedy to help prevent and overcome colds and flus.